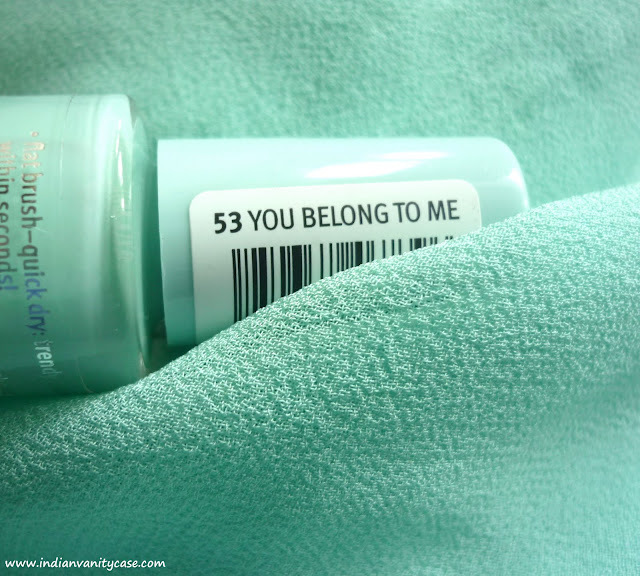 Indian Vanity Case: "You Belong To Me"
"You Belong To Me" can sound both psycho and passionate. Psycho - if you're squeezing the person's neck and say it without blinking. Passionate - if you're running your fingers through the person's hair and say it with a smile on your face. Okay, they both sound psycho. Well, how should I know?! I've done neither. Well....at least not to a living thing. So, the latest nail trend is colored French tips, which I love love love- mainly coz I'm very lazy about doing my nails & I hate waiting for them to dry. These cute little Essence Nail Polishes are too quick drying that I find them difficult to neatly apply all over my nails, but that works in my favor when I use them only on the tips. P.S: I haven't had a manicure for more than a year (maybe 2), hence the dry cuticles. hehe...i loved the intro..looks like a cool thing to do on a lazy day.. I love this shade too! Been wearing it all through summer :D Looks gorgeous on you!! coming back to the color, I love it. I love the concept of colored french manicure.. esp loving ths color.. gorgeous.. Such a lovely shade! I don't have any pastels now that I think of it! I've heard lots about essense having cheap and nice things, too bad I can't find it here! i like the new concept of french manicure....& i would love to try on at once.